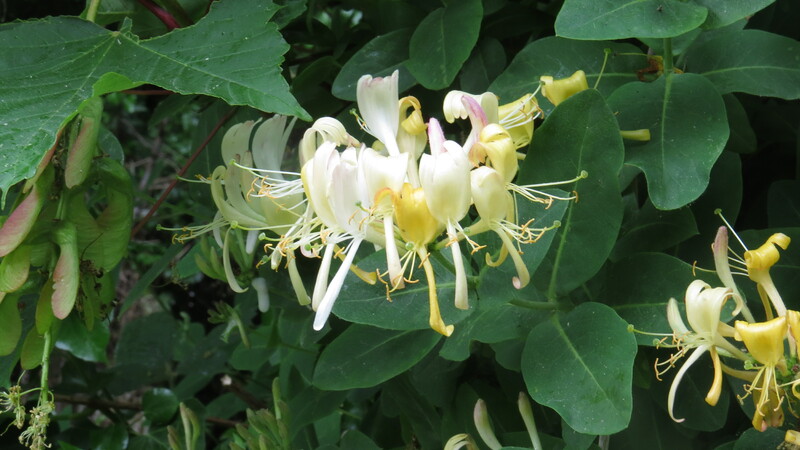 Dear Readers, for me the heavy scent of honeysuckle conjures up memories of summer holidays when I was a child. There was the time in Pembrokeshire where we walked along a lane so fragrant with the smell of the plant that it felt as if we were drinking it rather than smelling it. As night fell, the bats appeared, flittering above our heads to pick off the cloud of mosquitoes that each member of the family was attracting. The highlight of the evening was when I hopped over a fence to attend to a call of nature and nearly squatted on a hedgehog, but that’s another story. Then there was the time we stayed in a cottage just outside Carlisle, where the hedgerows were entangled with honeysuckle and old man’s beard. There was a Friesian cow in the field opposite and a few evenings after we arrived, before our astonished eyes, she gave birth to a little black calf. She licked it clean and it tottered beside her, eventually finding her engorged udder. We went to bed filled with the warm glow of seeing new life being cared for so attentively. The following evening, the farmer took the calf away, and the mother paced and bellowed all that night and the next day, the calf answering from the shed where it had been put with all the other calves. It had never occurred to me, townie that I was, that there was such a high price to pay in suffering for our dairy produce, or that we were taking the food that was meant to feed another species entirely. I think I thought that cows just generated milk for the love it, like the happy cavorting cattle in the Kerrygold adverts that were popular at the time. And so, when I smell honeysuckle, it has an edge of something indecent about it, something decadent. Which is obviously not the fault of the poor plant. 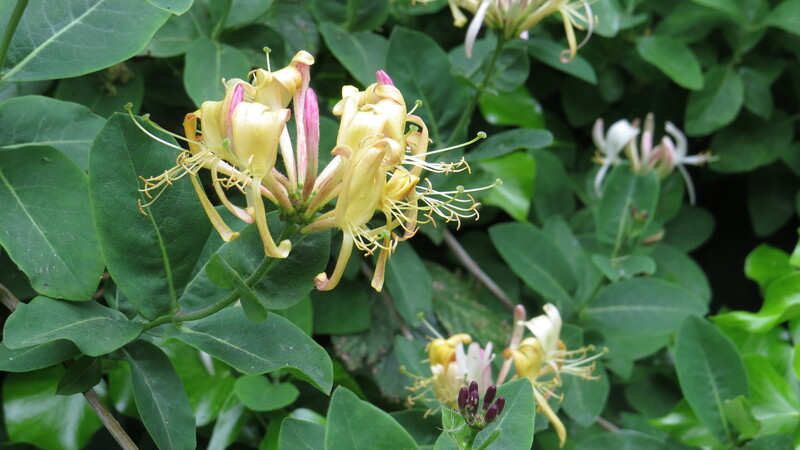 Honeysuckle is a member of the Caprifoliaceae family, which also includes Elder, Snowberry and Guelder Rose. It is a native plant, and is pollinated by long-tongued bees and moths, who are said to be able to pick up the smell from half a mile away – if you watch carefully you can sometimes spot hawkmoths hanging around the flowers. The flowers themselves are like nothing else that one is likely to spot in an English hedgerow, and of course the aforementioned scent is a dead giveaway. I found this specimen in the cemetery, close to where the foxes are fed. 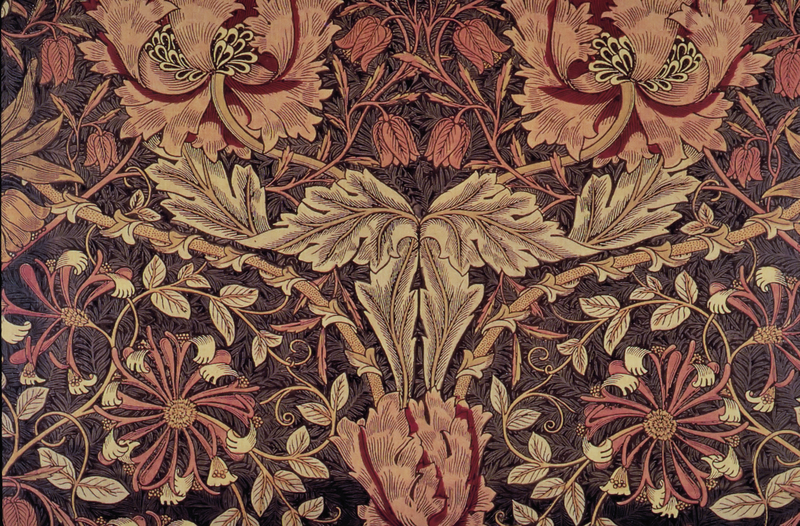 We might expect such an unusual flower shape to have encouraged artists and designers, and indeed it influenced William Morris, who used it as a design in several of his wallpapers and fabrics. ‘Oh how swete and pleasaunte is Woodbinde (Honeysuckle), in Woodes and Arboures, after a tender soft rain: and how frendly doe this herbe if I maie so name it, imbrace the bodies, armes and branches of trees, with his long windyng stalkes, and tender leaues, openyng or spreding forthe his swete Lillis, like ladies fingers, emong the thornes and bushes’. 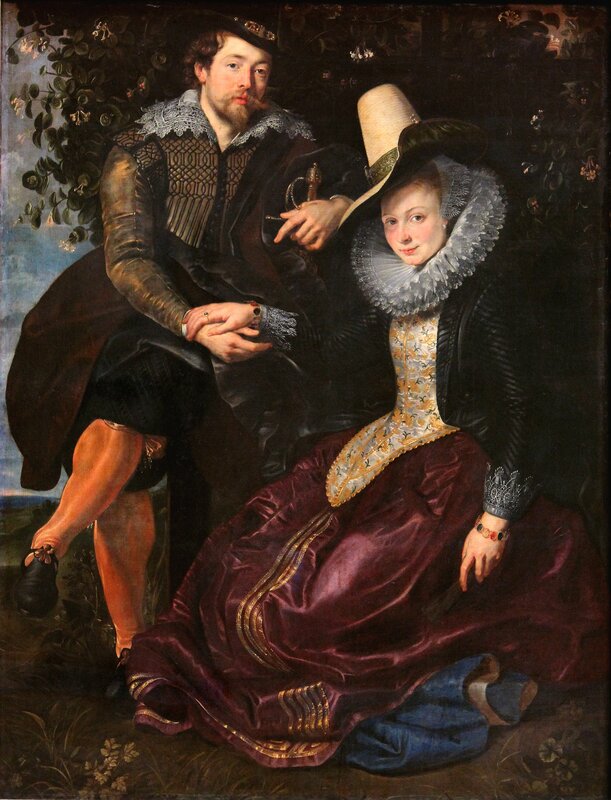 No wonder that a honeysuckle bower was seen as a site for romantic liaisons of all kinds and was associated with faithful love, as in the self-portrait of Peter Paul Rubens below, with his first wife, Isabella Brant. 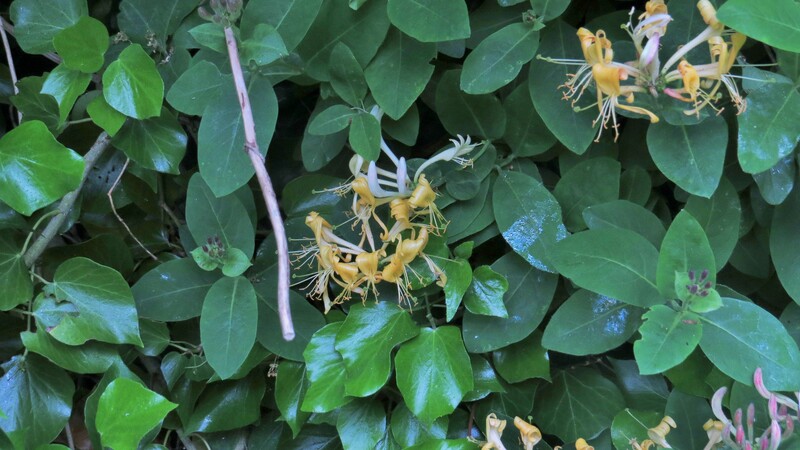 However, the honeysuckle, for all its sweetness, can be a bit of a brute. 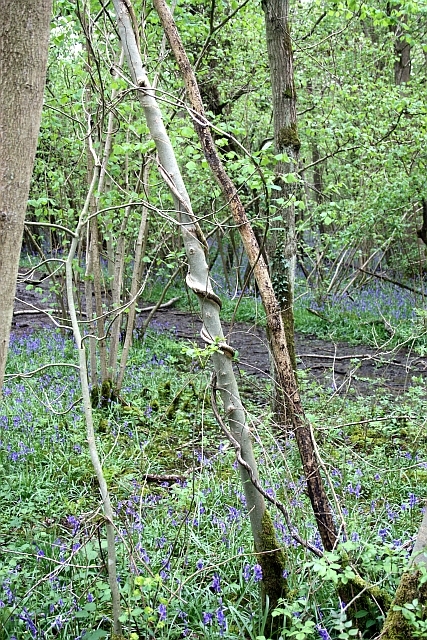 In forests, it can disfigure young trees as it clambers up them for support, and the twisted branches were used as ‘barley-sugar walking sticks’. You can see how the honeysuckle would distort the wood into the typical ‘barleysugar’ shape here. Photo One – credit below. You might think that a plant which smells so sweet would have lots of foodie potential, but apparently not. I have found no recipes, not even for the usual candied flowers. However, it was apparently considered to efficacious in the treatment of eye ailments and for snake bite. But it is in the folkloric aspect of the plant that my story comes full circle. In some places it was considered to be an unlucky plant that should never be brought into the household: it was said that it could cause sore throats, and that it could give young girls lascivious dreams (and I wonder if the languid scent of the plant was associated with both these phenomena). But in Scotland, it was sometimes gathered on May Day and used to garland the dairy, as a protection for the cows and the milk that they produced. I remember the smell of honeysuckle and climbing roses wafting through my bedroom window in our holiday cottage all those years ago, as the moon shone silver on the coverlet and the cow bellowed until she was hoarse. I doubt that any scent would have given her much solace. This entry was posted in London Plants on June 8, 2016 by Bug Woman. Looking at Rubens’s dual portrait made me wonder if it could almost be a depiction of the honeysuckle’s wayward, enticing self. The swirling determination in the clothing folds and the artist’s shocking orange stockings, seem tempered ever so sweetly by Isabella’s steadfast, yet inviting gaze. Could she be warning us not to intrude on the tangles of the bower, or inviting us in for a heady sniff? It is an enigmatic portrait, isn’t it! And I especially like the muscley legs in the orange tights. Tights for men are very underrated I think :-). A stunning plant indeed the honeysuckle and like moths I can smell it before it comes into view! Thanks for another great post weaving (like the plant) through folklore and literature and art! I laughed at the hedge call of nature mention as I had a similar incident a while back only with an adder! But yes that’s another story!! Yes a good idea for a blog!! !The adder episode was on a gully behind a Cornish cliff near Porthgwarra and the adder was sunning himself in the bracken…I don’t know who was more alarmed me or him!! !